It’s official, the Vancouver Canucks do not like this new lottery format. Two years in a row, the bottom-feeding club has suffered a multiple-slot slide, falling from third to fifth in 2016 and tumbling from second to fifth this past June. While those spots are crucial, especially at the very cream of the crop, the Canucks left Chicago happy and optimistic. For their first selection, fifth overall, the Canucks selected the extremely skilled centre, Elias Pettersson from Timrå of the Swedish Allsvenskan. The lanky 18-year-old offers good speed, a quick release and the vision and playmaking abilities of a future top-line pivot. He comes to the organization undeveloped physically, standing 6-2 and weighing just 165. A well-developed friendship and built-in chemistry with Canucks’ prospect, Jonathan Dahlen likely played a role in the team’s decision to draft Pettersson. The two have the potential to become the next set of Swedish duos to lead the Canucks’ offense. Pettersson immediately springs to the top of the organization’s prospect chart and has the highest offensive and most-impactful ceiling. The 18-year-old has returned to Sweden after putting on a show at the team’s development camp and will suit up for Växjö of the SHL in 2017-18. Read more about Pettersson here. Heading into Day Two of the draft, the Canucks owned a pair of picks in the second round and ended up selecting once more in each subsequent round. With their first of the two second-rounders, Vancouver selected skilled winger Kole Lind 33rd overall from the Kelowna Rockets. The feisty winger recorded 30 goals and 87 points in 70 WHL games – good for 15th most in the league and fourth most for draft-eligible players. Lind will return to the Rockets this fall and has earned himself an invitation to Team Canada’s World Junior Summer Showcase. Realistically, he should be considered something of a long shot to crack the roster next Christmas. As an early birthday, this will be Lind’s final shot at the U20 tournament. Lind plays a robust game that is highlighted by his quick release, strong skating and physical engagement. Read more about Lind here. Vancouver went to the OHL for its next two selections, taking burgeoning power forward Jonah Gadjovich 55th overall and Memorial Cup champion Michael DiPietro 64th overall. Gadjovich trailed only Alex DeBrincat in OHL goal-scoring this past season, tallying 46 in 60 games for Owen Sound. The 6-2 left winger owns soft hands, a heavy release and great puck-protection skills. He possesses a clean stride, but struggles to get out of the gate with much pop and his top-end speed leaves something to be desired. Skating improvement will be his No. 1 focus moving forward and if he can manage to get there, he owns a great deal of NHL upside. 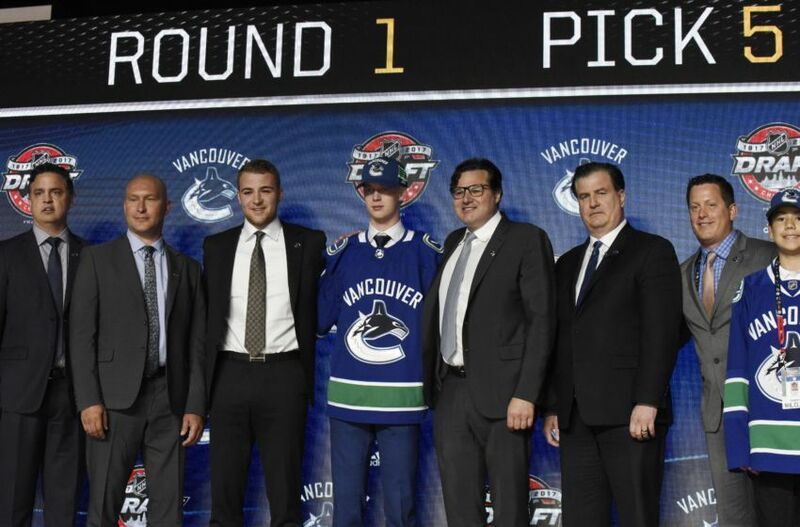 Gadjovich will also represent the Canucks at the World Junior Camp this summer and his combinations of skill and strength could be a welcomed addition to the squad’s bottom six. He’ll need a big first half of the season, but playing on a line with Nick Suzuki once again should help that. Like Lind, this will be Gadjovich’s final attempt to play at the WJHC. Read more about Gadjovich here. Drafting goaltender DiPietro early in the round brings a few things to the table for Vancouver. He fills an organizational need in the pipeline and is a proven winner at all levels. No disrespect to Dylan Strome, but he was the true MVP of the Memorial Cup as his backstopping was integral to Windsor’s eventual victory. The Ontario-native suited up for 58 combined regular season and playoff games, winning 33 and recording a .917 save percentage. He then ran the table through four Memorial Cup contests with a .932 mark and a CHL crown. The 6-0 netminder will join Lind and Gadjovich at Team Canada’s World Junior Summer Showcase and looks to be the favourite to back up Carter Hart and gain the experience needed to truly battle for the starter’s role in 2019. Read more about DiPietro here. The Canucks went digging in the Massachusetts’ prep school circuit, selecting mobile right-handed defenseman Jack Rathbone. Rathbone played most of his 2016-17 campaign with the Dexter School, serving as their captain. He also suited up in four USHL contests with the Green Bay Gamblers. The puck-mover is slightly undersized at 5-10 and 170. The added developmental time will surely help him build his strength to withstand the rigors of pro hockey. He is a naturally gifted offensive player who is adept at both skating and passing the puck out of trouble and seems to always have his head up. Reports are the 18-year-old is a coach’s dream as he manages to improve almost immediately when given proper cues. Read more about Rathbone here. Next off the board came draft-plus two defender Kristoffer Gunnarsson. He was selected 135th overall after Vancouver moved pick 112 to Chicago in exchange for picks 135 and 181. The 20-year-old Swede plays a throwback-style shutdown game. He offers strong physicality and a good stick to defend the blueline. He offers little in the way of puck-moving or offensive acumen, but he displayed his sturdy defensive play for Sweden at last year’s World Junior Championship from a bottom-pair position. He will return to Frölunda HC of the SHL this fall with the goal of playing a full season in the country’s top league. With their pick acquired from Chicago, the Canucks selected Petrus Palmu of the Owen Sound Attack 181st overall. The second-time eligible forward owns tremendous offensive tools. He mixes great speed and edgework with a heavy and quick release and loads of creativity. The knock, of course, is that he stands just a hair over 5-6 – the shortest player selected in this crop. The 19-year-old combats his height concerns with a lower centre of gravity and strong core which makes it difficult to move him off the puck. Palmu recorded 40 goals and 98 points in 64 games, good for fourth in the OHL. The Finn also peppered opposing goaltenders with 4.5 shots per game and was third in the league in PP markers with 15 and second overall with 43 total points on the man-advantage. Palmu will play with TPS in the Finnish Liiga this fall after signing a two-year contract with the team last March. There, he will learn under the tutelage of former Canucks’ defender Sami Salo, who acts as an assistant coach, and Saku Koivu, who works in a player development role. Read more about Palmu here. Finally, in the seventh round, 188th overall, the Canucks selected Matt Brassard. Passed over in the 2016 draft, it’s worth noting that the Oshawa Generals’ defender is a late birthday, missing the cut for this past draft by a few weeks. In a season split between Barrie and Oshawa, the right-handed defender recorded 12 goals and 20 assists in 62 contests. The mostly defense-first player with a strong outlet pass and proclivity for physicality will take on more responsibility as the Generals will likely contend in 2017-18. While I was unable to attend the camp this year, I spoke with several of my colleagues who did attend and gleaned some notes. As mentioned earlier, Pettersson was the standout of camp. His full array of offensive tools was on display throughout practice drills and into the scrimmage where he scored two gorgeous goals during regulation and added another in the shootout. The other big names came to play as well. Boeser and Dahlen looked a cut or two above the other forwards, while Juolevi continued his calm and poised play from the backend. Other notable performances came from Jack Rathbone who seemed to develop right before the coaches’ eyes; using his speed and smarts to more readily handle bigger, strong opponents during battle drills. Petrus Palmu used his tremendous puck protection skills to hold off even the largest of opponents and put on a show during drills, ringing shot after shot crossbar down. Young Stars Tournament – Penticton, B.C. For the seventh year in a row, the Canucks will host the Young Stars Classic tournament in beautiful Penticton at the South Okanagan Events Centre, running from Sept. 8 to 11. The four-team tournament will feature prospects from the Canucks, Calgary Flames, Edmonton Oilers and Winnipeg Jets. A special thanks to Ryan Biech (@ryanbiech) for continually pumping out top-end GIFs. If you’re interested in anything Canuck-related, you need to follow Ryan. Thanks for reading, and feel free to follow me on Twitter @CrazyJoeDavola3, where I often give unsolicited fantasy and prospect advice.